- It is a computer’s primary memory in which data has been pre-recorded. - It is extensively used in calculators, washing machines, microwave, computer's peripheral devices. How a generation of computers is classified? A By the devices used in memory and processor. B By the accuracy of the computer. C By the model of the computer. D By the speed of the computer. 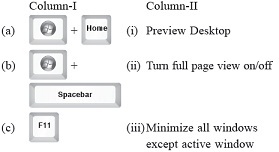 Match the following keyboard shortcuts given in Column-I with their tasks in Windows 7 given in Column-II. i think answer is "A"
Identify the following with the help of given example. It is just like the principal of your school. The principal has various responsibilities to manage the school, like supervising students, teachers, maintaining discipline, setting the examination schedule, timetable, curriculum, etc. In the same way, it performs various functions to manage the working of a computer. Which of the following translates a name like sof.com into numbers like 23.45.67.89? Which of the following is/are system software? 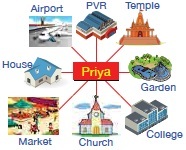 Priya is facing the Temple. She makes a 1/4 turn to her right and then 3/4 turn to her left. What will she be facing now? Clipart is found in ________ group of _______tab in MS-Word 2010.